Polish author Gzregorz Werner has but three solo releases for Doom. One of these, A Hidden Mountain Factory, earned a Cacoward in spirit as part of Doomworld's Top 100 WADs. 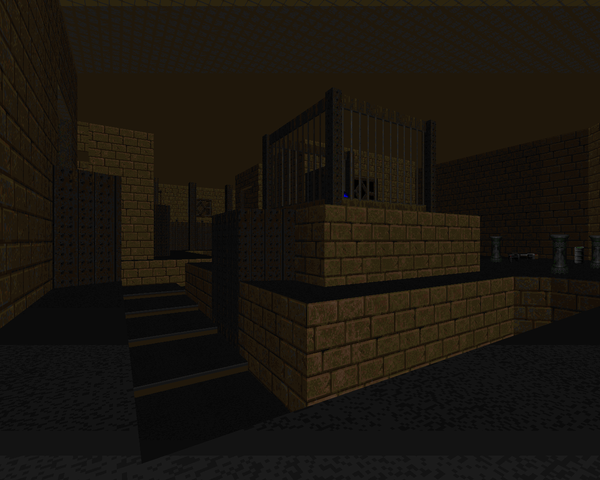 The Grim Reaper is another forgotten delight, published in 1996 and occupying the MAP01 slot of Doom II. 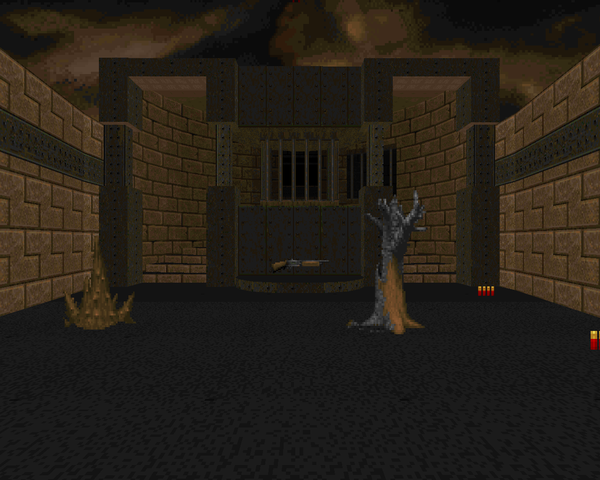 It's an unusual level that features a bunch of new graphics, that interestingly enough look to be derived from the original Doom II set, at least in part. They give the level a very distinct look between the windows and tetronimo walls. The other thing that grabbed my attention is a pair of classical poetry quotations, no doubt derived from Werner's English studies (William Blake's "Tiger" and Gerald Manley Hopkins's "The Windhover"). GRIMREAP is a pretty large level with an interesting layout and some very cool tricks. 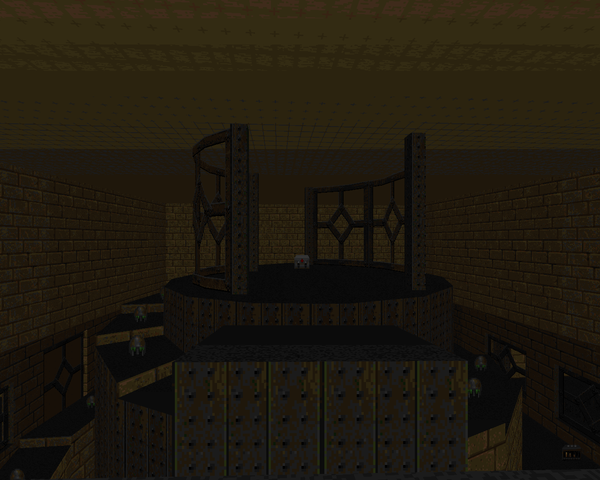 While it's Doom II brown, you have plenty of cool stuff to see, like the moment when a series of paths that connect the enemy teleporters collapse into the ground. It's quite a transformation. The northern section is more striking on the automap; it plays a bit poorly as monsters are secreted away in the twenty-five identical cubbyholes. The western area looks nice, using windows, doors, and that spiral staircase that leads to an understated elevator battle finale. Altogether, If you're not prejudiced against the Quake aesthetic, you have some good eye-candy to look forward to. Werner has produced another tough level, though once you hit a certain point, the health ceases to be so much of a problem. The opening will have you at your most desperate, followed by your initial foray into the underground downtown with monsters everywhere followed by even more enemies once you trip the wire. Most of your initial danger comes from hitscanners taking potshots as they sneak up behind you. It levels off once you grab the red key, with the second repopulation wave not nearly as dangerous. My favorite aspect of this level are the two major puzzles, the clues given by the poetry snippets on the walls. When they click, they'll make complete sense. The only reason you shouldn't play The Grim Reaper is because it's brown, brown, brown, and even that's a stretch, given that Werner has supplied a new selection of textures to liven up the place and the puzzles are the best kind – hidden yet hinted toward. I suppose you might also be against poetry in Doom, you troglodyte. Basically, play GRIMREAP, especially if you've tried and appreciated A Hidden Mountain Factory. This is a fantastic map that deserves more attention, was actually thinking of recommending it to you but well here it is I guess. :P The puzzles really do add character to the map as well.